Tina's dedication to results goes well beyond the sale. Her high level of loyalty, honesty and integrity resonates with buyers and sellers as she approaches each real estate transaction with enthusiasm and professionalism. 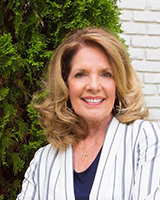 A full time real estate professional specializing in the luxury residential market and a ten year resident of Ponte Vedra Beach, Tina has been making real estate dreams a reality since 1982. Searching for a new home or selling your current one can be a complicated and exhausting experience. It is absolutely essential to find a real estate agent that is deeply involved in the business and loves what they do to show you the way. With a strong love for real estate, and eye for detail, Tina's greatest goal as your agent is to make the process of buying or selling your home a seamless one. Every transaction is different, but with a listening ear and adaptability, Tina can find the best solutions to all of your needs. Knowledge of Florida's multifaceted market and close attention to detail complement her collaborations with clients. Her commitment to outstanding customer service and her "Can Do" attitude has resulted in a client base made up largely of repeat buyers, sellers and their referrals. Whether you are buying, selling, purchasing your first home or simply relocating to a new neighborhood, let Tina "show you the way home."